I have something super cool for all of you EJ12 Fans. As some of you know I was fortunate to win the "Name the Snow Monkey in Kimono Code Competition" and one of the judges prizes for the "EJ12 Girl Hero Book Trailer Competition". I got sent an awesome prize including an early and signed copy of Kimono Code. HOW COOL!!! While the public still has to wait 23 days. Plus printed at the beginning of all the books it says my name along with other competition winners, YAY!!!!!!! I have also messaged Susannah Mcfarlane with some Kimono Code based questions. So stay tuned for another EJ12 Interview. But for now an exclusive and early Kimono Code Review. OMG! I am so glad I got this book early. Because it is so completely awesome. You find out so much and the early sneak peak first chapter on the EJ12 Site really leaves you at a cliffhanger, wanting to know more. It is so good. Once you have read it all you are like "OMG, OMG". Cos there are so many surprises. You could almost see the Japanese culture flooding through the pages, which i think is good. Because if your going to write about a different country, you need to know your stuff. I thought the Cherry Blossom idea was so cool, as I know that they are really significant in beauty and the Japanese culture. I loved all the cool and quirky disguises and as always the smart Charms/Gadgets used throughout the story. I also loved the moral in the story. About being calm and seeing life for what it is. There was a really peaceful vibe. It was so cool reading the parts with Sakura (meaning Cherry Blossom) the Snow Monkey, because that was the name myself and 6 others suggested for it. I was also so surprised to see that Emma's friend, Hannah had a pet budgie called Sunny. Spelled the same way as me. How cool, I am hoping it was named after me, but it's doubtful. 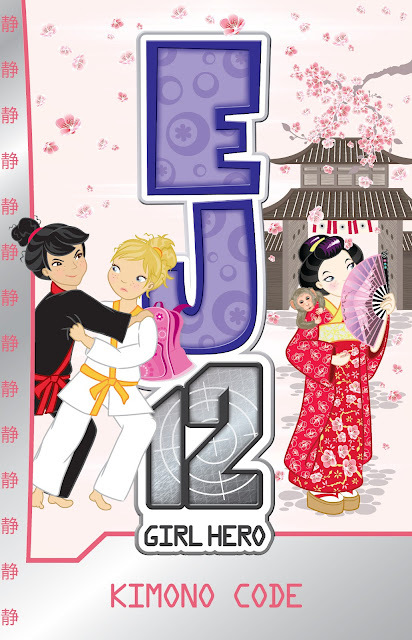 I really loved the cover, it was so well detailed and colourful, with bits and pieces from the Japanese culture everywhere. As always it was illustrated by artist Dyani Stagg! Well done, I think it is the best cover yet. I really loved how Kimono Code ended. It was just so good and I really enjoyed it and I thank Susannah and the EJ12 Girl Hero Team for sending me it!!!!!!!!!!! As soon as it comes out buy it, cos it is awesome. I rate it 10/10!!!!!! Now I have to wait till next year for the next EJ12 in the series, Big Brother to be released. But if you are still anxiously waiting for Kimono Code to come out, why not read the first chapter online here. I been waiting AGES for the kimono code and it's still isn't out yet, can you please tell me a little sneak peek how hannah didn't get in shine Please!!! For putting my blog button on!!!!!!!!!!! Anytime Nattasha! Thanks for putting mine up!!!! I have just got an early copy of kimono code too! Hi, here's an award from me. It's the Versatile Blog award! Thanks for the review Sunny!